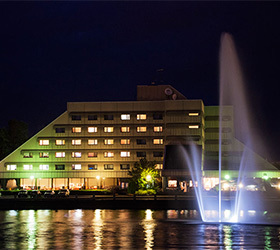 "Druzhba Hotel" is located in the central part of the city on a picturesque bay shore, near the bus and railway stations. The hotel windows display a splendid view of the historical monuments. Druzhba Hotel building was constructed in 1982. The latest reconstruction took place in 2012. The six-storied complex can accommodate up to 200 guests in 102 rooms. Each room has its own bathroom, telephone, TV set with satellite television, radio. Two elevators operate in the hotel. The guests are welcome to the hotel's two restaurants, pub, and Dandy nightclub. "Zelyonaya Alleya" (Green Lane) and "Baltic Park" restaurants serve a variety of Russian and European dishes. Any order can be delivered via room-service. At the cozy "Morskoy Volk" (Sea Wolf) bar, guests will be offered a wide selection of beers and cocktails. Views of the bay are open to the eye from the summer terrace. Hotel ground floor houses a sauna and a small swimming pool. For storing valuables and papers, a safe box is available at the reception. Reception managers are always ready to assist with Internet search, photocopying and printing of documents. For holding conferences, the hotel provides a conference hall with 40 persons capacity. Other services include secured parking, wireless Internet access, laundry, bike rent.